I knew how powerful Maxscript was,but was always wary of looking at codes. However, a few days ago, i became quite interested in this tool and tried my hand at it. 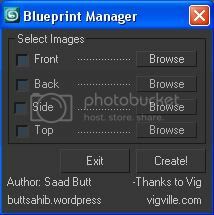 So here is the outcome ; Blueprint Manager. Use to Import orthographic reference sheets to 3DSMax and automatically apply them to newly created respectively named planes in the respective viewports. Mainly made for vehicle modelers and for artists who use modelsheet.